I love cooking this time of year, and the weather was so perfect for it this weekend that I went a little crazy in the kitchen. 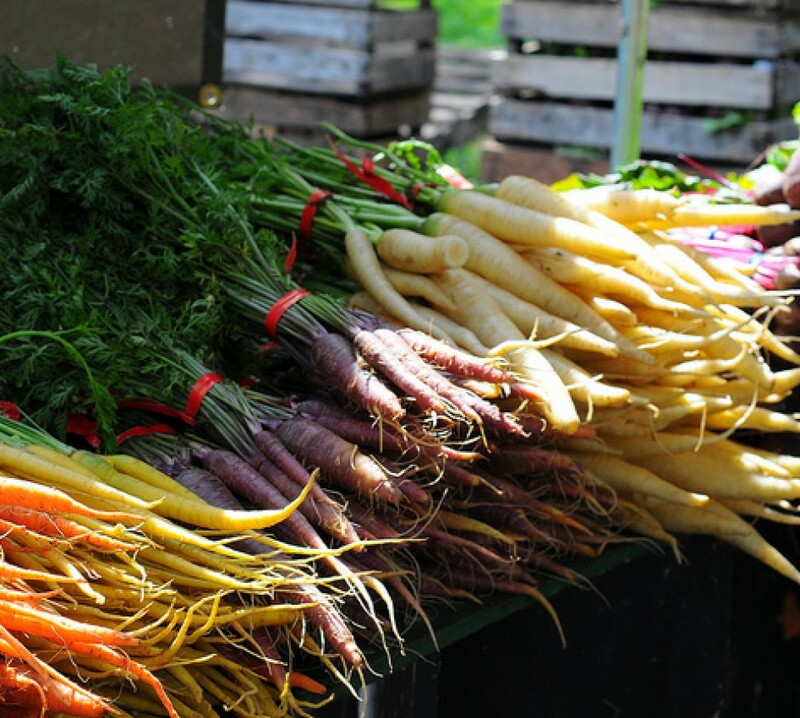 A Saturday morning visit to the Greenmarket yielded a bounty of vegetables, and I didn’t wait long before putting them to use. When Mike and I cook almost anything with bones or shells, we reserve them in resealable bags in the freezer to make stocks. Mike spatchcocked and roasted a chicken on Friday, and I planned to use the backbone and leftover bits from that bird to make a batch of chicken stock, but first, I pulled out all of the bags of beef bones and scraps in our freezer and cooked them down into a rich beef broth. I portioned out about half of the stock and set it aside to cool (and later freeze), and reserved a couple of quarts of it to go into a beef, mushroom and barley soup for Saturday night’s dinner (utilizing chunks of the super-tender meat that had been slowly simmering all day in the broth). On Sunday, we took a quick trip down to Fort Greene for brunch and a visit to Thirst for wine, and when we returned I got back to work, chopping enough red onion, carrot and celery to fill a large bowl, tossing the trimmings into a pot with all of our chicken bones and scraps (plus the remains of one guinea hen). While my chicken stock perked away, I blanched and peeled some fresh San Marzanos and put together a big batch of vegetable soup for lunches this week. Figuring it would save some time and effort later, I set aside some of the mirepoix and tomatoes I had already prepped to use in dinner later on. 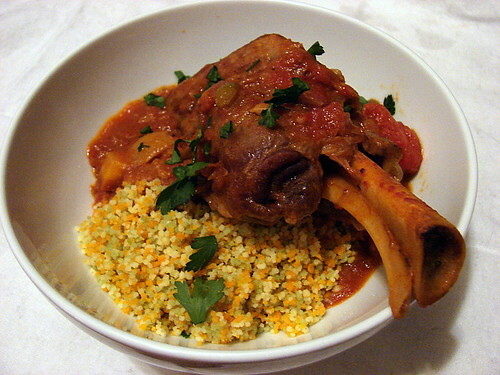 That dinner was lamb shanks, browned in a bit of olive oil and braised in tomato broth seasoned with cumin, coriander and cinnamon and served over couscous. I usually make this dish with fresh Meyer lemons when they’re in season, but I had an open jar of preserved lemons in the fridge which worked just fine. Though some of the ingredients might seem exotic, this dish really couldn’t be simpler, and your kitchen will smell amazing. Heat oil in a large heavy-bottomed pot. Add onion, celery and carrot, season with salt, and cook over medium heat until onion is translucent. Add garlic and cook just a few minutes, until fragrant. Add zucchini, a pinch more salt, and stir. Push the vegetables aside to make a hot spot in the bottom of the pan and add tomato paste, allowing it to caramelize for a few moments before stirring it through the vegetables. Add the tomatoes and their liquid, the water and the herbs, cover the pot and bring to a boil. Reduce the heat and simmer 20 minutes, until the carrots are tender when pierced with a fork. Add the beans and kale and stir through. Adjust salt if necessary. Cook until the beans are warmed through and kale is tender. 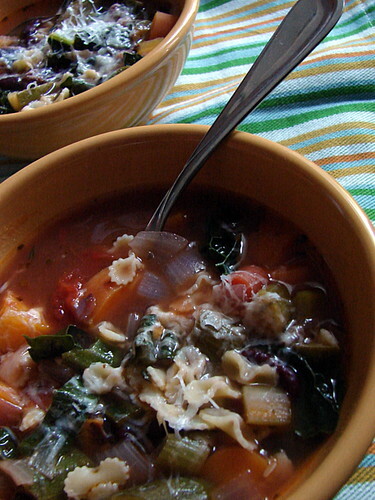 Add a spoonful of cooked pasta to serving bowls if desired, and ladle soup in. Top with grated cheese. Heat oil in a heavy-bottomed pan over medium-high heat. Season lamb with kosher salt, dust lightly with flour on all sides, and add to pan. Brown the meat well on all sides, then remove to a platter and set aside. Add mirepoix to the pan, season with salt and cook until onions are translucent. 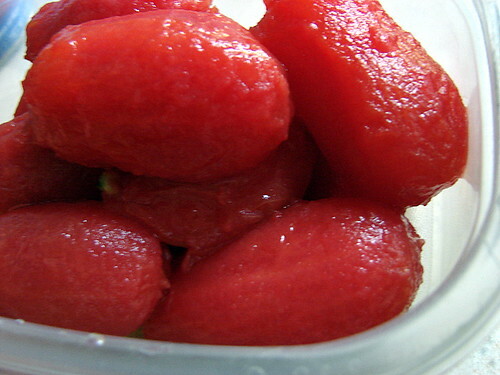 Make a hot spot and add the tomato paste, allowing it to caramelize briefly. Sprinkle the ground spices over the vegetables, and stir everything through. Add vermouth and let it bubble up, scraping the bottom of the pan. Return the shanks to the pan and add the bay leaf, cinnamon, lemon and tomatoes. Add enough water to the pan so that the shanks are covered about 3/4 of the way. Reduce heat to low, cover the pan, and allow to cook one hour until the lamb is very tender and the sauce is thickened. Serve over couscous, and garnish with chopped parsley. The barley soup looks delicious. I’ve cooked a chicken stock, but I haven’t tired to cook a beef broth yet. I like to eat vegetable soup in the cold weather too. I sometimes cook it. Thanks, guys! 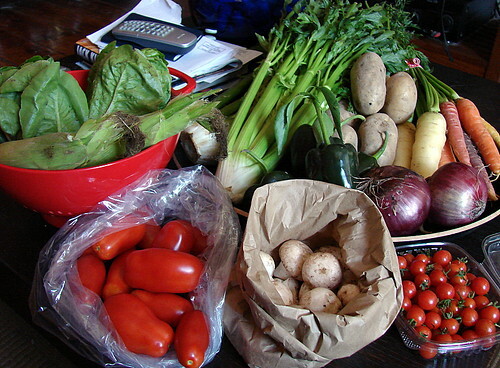 I love that we’re getting into cooler weather so I can make stocks and soups and braises. Like I’ve said, it’s my favorite time of year to cook! We have just hit winter here in Sydney which is soup weather. 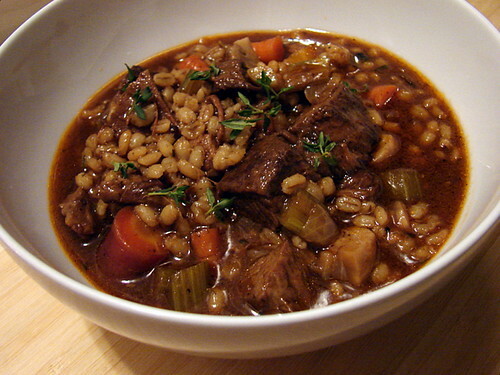 I noted your photo but could not find your recipe for the beef, mushroom and Barley soup, it looks so good. could you direct me to the correct page or jot it down please. Hi Peter! My soups tend to be “toss things into a pot, taste, season, taste again” sort of things, very imprecise, but I can give you a rough outline of what I did here. I had made a batch of beef stock using lots of bones, some of which had meat attached, so I separated off that meat to put into the soup. I generally start my soups with a basic mirepoix of onion, celery and carrot, sauteed in a bit of butter or olive oil until soft, and for this soup I imagine I would have added a couple of tablespoons of tomato paste to caramelize before adding the stock and beef to the pot. I generally add a bay leaf and several sprigs of fresh thyme as well (plus, of course, kosher salt and fresh ground pepper to taste). I don’t recall if I used fresh or dried mushrooms here (or a combination of both), but you can probably use whatever you’ve got on hand. A splash of red wine is never out of place in a beefy soup, so that can go in as well, and I usually cook my barley directly in the soup – usually 3/4 to a cup for a big pot. Good luck!